The biggest opportunity you have with you, to preserve your inner peace and happiness, is to say “No”! Just leverage it. A recent acquaintance who lives in another city in India reached out to us. We have barely known her for a week. She’s an entrepreneur and a very well groomed, warm and erudite person. Interestingly, we haven’t met her. The introduction and subsequent conversations have all been over email and phone. Over those interactions, which happened almost daily for five consecutive days, we realized that she was quite pushy and was keen to have her view on things, people and events around her. She wanted us to help her contribute to victims of Chennai Floods. Which was fine. And we did whatever was within our means by referring her to two organizations we know that, among several others, are leading the efforts on that front: Bhoomika Trust and Hand in Hand India. She wasn’t very convinced with our recommendation because she wanted to connect with beneficiaries so she can help them directly. That was something, we reckoned, which we were neither comfortable doing nor competent to do. Having known about us through a newspaper article that appeared recently, during one of our conversations, she said that Vaani and I held several limiting beliefs – “which is why you both are still mired in debt”. Over the years, we have understood that people have a right to their opinions and so we don’t either take any opinion amiss or make efforts to erase such opinion. We say what we have to say and leave it. Then, a couple of days ago, this lady came up with a request over email – to provide some business-related logistical support for her customer in Chennai. We politely wrote back saying we can’t help her with that request and that we would appreciate if she spared us of such requests in future. It is possible the mail ticked her off. Because we haven’t heard from her since! But here’s the point: when someone is trying to push you to do – or say or accept – something that you don’t want to, and when your earnest and polite suggestions make no impact, just say “NO”. Just say it as it is. Remember: between how you will feel doing what you don’t want to do, and how the other person will feel hearing your “No”, your feelings are more important to your inner peace! Now, this advice does not apply to situations involving rank strangers or acquaintances alone. It applies to anyone who wants you to do something you don’t like doing – could be a boss, a colleague, neighbor, friend, family or whoever. You don’t have to be rude. You just have to be firm. Ideally a diplomatic “No” should help the other person get the message. But sometimes people are so consumed by their views and opinions of others or they are so immersed in what they want achieved that they end up being unnecessarily pushy. This does not mean they are “bad” folks. They are just the way they are. 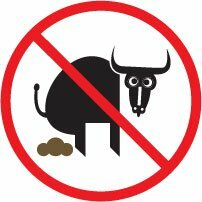 And the best way to get the message across to such people is to never BS. Just say it as it is. As someone, wisely, has said, “The shortest distance between two points (of view) is a straight line.” Walk that line. Say “No” when you have to. Or, simply, never say “Yes” when you want to say “No”! Now, that’s the lil’ secret to protecting your inner peace. Feeling incomplete and restless? Don’t try connecting the dots! There will be times in Life when everything will seem so unstuck, so unsure, so unpredictable. Whenever you feel this way, don’t let it all cook within you – just turn around and go to sleep! Last night when I lay down to sleep, I felt the same way myself. I had been watching Rang De Basanti(Rakeysh Omprakash Mehra, 2006) for the umpteenth time on TV – somehow the move never tires you out; it instead grows on you. In the wake of the Chennai Floods, every issue that DJ and his friends raise in the movie, made me feel very disturbed. 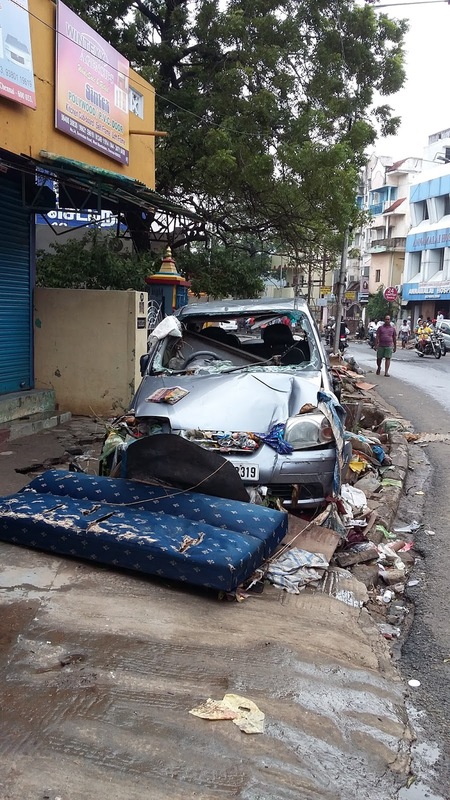 Since there is a strong apprehension among most people in Chennai that the floods were a result of poor decision-making by the authorities concerned, issues like lack of accountability, leadership and collective public action to challenge and change status quo – magnified by the RDBviewing – made me restless. And then there is our enduring bankruptcy and the uncertain future looming large: of dealing with every day – practical, survival-related – challenges as 2016 arrives. We are yet to begin repaying our debt and the discomfort of living with – and in – such a seemingly-endless situation is immense. Our daughter’s graduate studies are coming up in 2016 and our son has a niggling medical condition that needs attention. My end of the family still chooses to remain estranged, while we don’t have the means yet to financially reciprocate all the day-to-day support that Vaani’s end of the family provides us. Phew! Sometimes, I just wish that all this incompleteness – and the restlessness it causes – simply dissolves. Yes, I am human too. That’s when I recalled a learning that my college mate from Kerala, Rajmohan Pillai, of the Beta Group, had shared with me some years ago. He had told me, while buying me and Vaani a multigrain sub at a Subway in Nungambakkam, Chennai: “Vaani and AVIS, don’t try to solve all your problems all at once. You simply can’t. Just be at them, just be; and over time, they will all get resolved.” I never understood the import of what Rajmohan was teaching us when he first said this. But over the years, I have greatly valued his advice. So, I just turned off the TV and went to sleep. I slept well. My practice of mouna (daily silence periods) and my spiritual evolution has helped me realize the futility of worrying. So, last night, I wasn’t worrying. Yes those worrisome thoughts were arising. But I was choosing to remain unaffected by them. 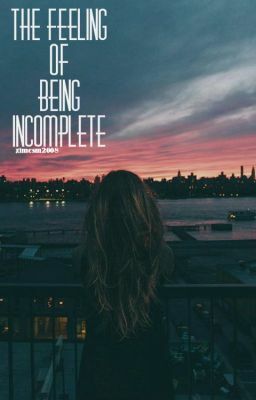 Yet, there is an incompleteness I felt. And, from experience, let me tell you feeling incomplete at such times is very natural. The human mind craves for so much control on Life situations. But Life is more powerful. She can never quite be tamed. We often don’t understand this truth about Life and respond to such incompleteness in one of two – or both – ways: we worry and/or we connect the dots of all that is wrong with our Life and magnify a pimple to look like a tumor! Both responses are futile – worrying cannot solve problems and linking all your problems up only confounds an already complex situation! The best way, I have learnt, is to switch off the mind when it goes into an overdrive on either – or both – fronts. To switch off the mind, you must just live in the present. The mind can only thrive when it is generating thoughts from the dead past or predicting the unknown future. In the present the mind is powerless. Last night, since even my attempt to be in the present – watching RDB – turned out to be disturbing me, I simply went to sleep. And I believe there’s nothing wrong with that choice. Let’s understand that each problem in Life is unique. Each one has a tenure. No problem in your Life – or mine – is going away unless it has served its time – and purpose! So, when you can’t solve a problem with your (human) intellect, agonizing over it is of no use. You simply have to try again – and again and again and again – with a fresh perspective, with renewed energy and vigor. As I go down to work on my Life and its myriad, incomplete, situations, I wish you too luck. If we can’t immediately solve our problems, let’s at least avoid connecting the dots and making everything seem menacing and scary! This is the only way to inner peace and strength when you are in the throes of a storm! Author AVIS ViswanathanPosted on December 10, 2015 March 14, 2016 Categories Art of Living, Beta Group, Chennai Rains, http://schemas.google.com/blogger/2008/kind#post, Inner Peace, Intelligent Living, Mouna, Problems, Rajmohan Pillai, Rakeysh Omprakash Mehra, Rang De Basanti, SolutionsLeave a comment on Feeling incomplete and restless? Don’t try connecting the dots! No matter what, Life goes on…and so every show must go on too! Since the Chennai floods arrived around the same time that the famous annual Madras Music Festival was set to begin last week, there is considerable debate on whether artistes and sabhas should go ahead with the festival this season. I believe they should. The Festival must go on. However, the choice to perform or not must be with left to the artistes. If they feel like performing, they must. And if they don’t feel like it, they may like not to! To be sure, the Dhananjayans, Vijay Siva, Bombay Jayashri and a few others have chosen not to perform. And yet Sanjay Subrahmanyam performed yesterday. Now, there’s nothing wrong with either choice. Music, if anything, is a form of expression of inner joy. Undoubtedly, all artistes, like everyone else is, are tormented by the floods in Chennai and the havoc it has caused in the lives of her citizens. While some artistes may want to immerse themselves in their music at this time, to get over their feeling of grief or to invoke their inner peace, others may not be able to bring themselves up to sing. And we must respect their individual choices and sentiments. Having said that, we must not forget that music has enormous healing power when it is performed as an offering to the Universe. No artiste really performs just for money or fame. They fundamentally perform because they lose themselves to the act of performing. When music, in fact when any work or service, is delivered with such selflessness, when it is an invocation and not just a mere stage performance, it heals. 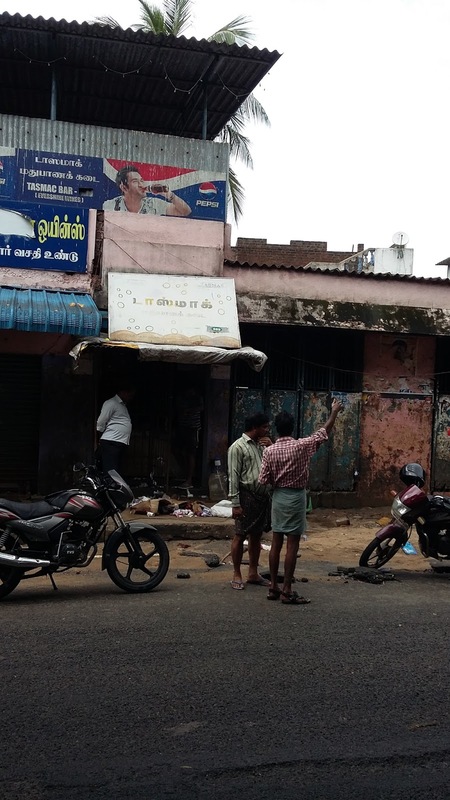 What Chennai – and the world at large – needs now is healing. In my humble opinion, going ahead with the Madras Music Festival this season would be not just right and apt, it will be hugely healing as well. And, irrespective of what artistes and sabhas decide over this week, on what they want to do, let us not judge anyone. After all, all our lives will go on. They have to go on. Weddings will happen – given the season’s muhurthams already having been calibrated per an almanac – people will go to the movies, to parties and to nightclubs, cricket and football (ISL – Indian Super League) will be played and the Christmas and New Year festivities will soon be indulged in. Moping and mourning – not just now, but at any time – serves no purpose. If anything it can make people depressive. And what the people in Chennai need now is an uplifting energy, a celebration of human spirit, which only music can provide instantaneously – and uniformly! One of the historic examples of the role musicians and music played at a calamitous time is of violinist Wallace Hartley and his band playing on even as the Titanic sank on the night of 14~15 April, 1912. After the Titanic hit an iceberg and began to sink, Hartley and his fellow band members started playing music to help keep the passengers calm as the crew loaded the lifeboats. To me, that’s true heroism, that’s a true celebration of Life! 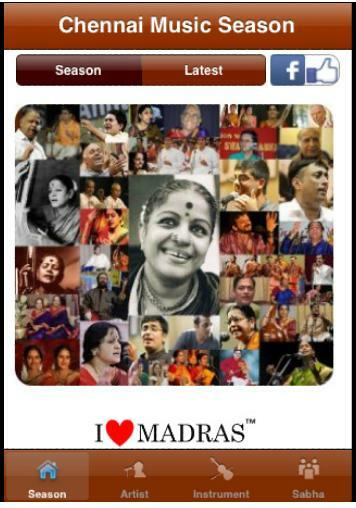 So, to the artistes of Chennai, I would simply say, let the music play on….because the show, called Life, must go on…! You can’t choose Life. It simply happens to you! Are you shaping your Life or are you being shaped by Life? In understanding this question and appreciating its import lies the key to spiritual growth. We are born without choice; this Life has been bestowed upon us. Our early upbringing, our education, the way we are engineered to receive knowledge, gain from it or let it go, are all beyond our control. Things just happen. As we grow older how we meet people, what we gain from or lose because of them is again a matter of the flow of Life, beyond our control. A great friend as your spouse or a nag, a soulmate or a cheat, a benevolent boss or a tyrant, exceptional children or vagabonds, a steady income or joblessness, nothing comes announced, nothing’s controllable. 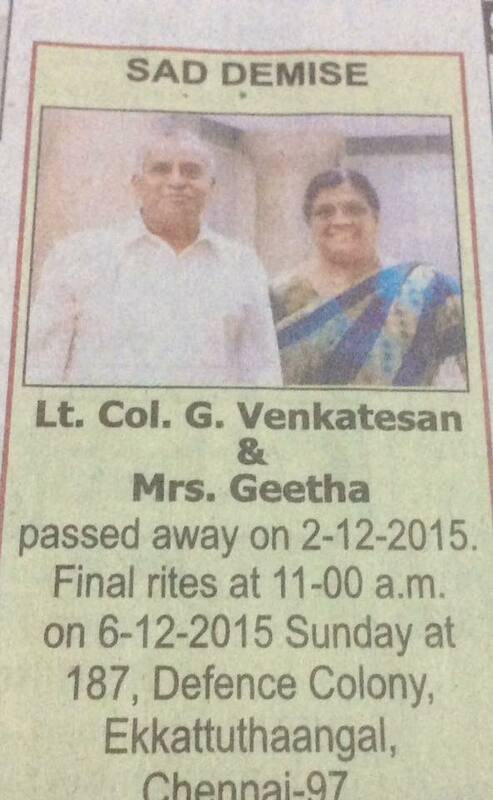 This morning’s Hindu had the obituary announcement of Lt. Col. Venkatesan and his wife Geetha, who died on 2nd December in their home in Defence Colony, Ekkattuthangal, Chennai. That was the night of the floods. The announcement had no details on the cause of death. But a subsequent Facebook post, which has since gone viral, talked about how the couple were caught unawares by the floods and stood on top of their dining table screaming for help, unable to cope with the fury of the water that gushed into their home. It is believed both of them drowned that night, in their home, not able to even escape to their terrace! Could the Venkatesans have controlled what happened to them? The reality, the absolute and only Truth, is that we can’t ever control Life. And yet we have been told, conditioned, made to believe, that we shape our lives. Shed this thinking. Life simply happens. You__and I__get shaped by it. Over time, what goes up comes down. And what comes down goes up. And at some point all our lives, our stories, have to end, with death! Sri Nisargadatta Maharaj, an ordinary storekeeper, who lived in Mumbai, until his death in 1981, and a spiritual thinker and teacher to thousands, says, when true awareness has come from within, we will be ‘open and willing to let Life just flow’. “Be like a cinema screen. Clear and empty. The pictures pass over it and disappear, leaving it as clear and empty as before,” he says. The ability to be ‘clear and empty’ at all times, untouched by the pictures of our lives, is the highest, most exalted state, or the final shape, that Life can give you__and me! To get to this pinnacle of spiritual evolution, we must begin first with accepting Life as it happens – instead of trying to either resist it or analyzing it beyond a point. The rest of the ride up this escalator will then be as blissful as it will be eventful! Author AVIS ViswanathanPosted on December 7, 2015 March 14, 2016 Categories Art of Living, Chennai Rains, http://schemas.google.com/blogger/2008/kind#post, Inner Peace, Intelligent LivingLeave a comment on You can’t choose Life. It simply happens to you! Life is a great leveler. At times you don’t have much choice but to just go with the hand that you have been dealt with. A Facebook and WhatsApp forward that was shared by my friend caught my attention. Here’s what it had to say. “I am prassana venkatram working as a system analyst for an American software company in Chennai. Presently drawing 18 lakhs P.A. proud owner of a 3BHK in suburbs of Chennai. Today I have 2 credit cards with more than 1 lakh credit limit and a bank balance of 65 thousand in my account. But due to heavy water logging I am not able to move out my house, all I need is water and food for my survival. Till yesterday I was worried about my appraisal and was expecting at least 15% hike but today I am standing in my terrace waiting for a food packet. Prassana’s candor makes the learning he shares very stark, real and relatable. At least those in Chennai, at the moment surely, can relate to what he says. Another story I saw in this morning’s TOI threw up a similar learning. It narrated the experience of Deepika from Mudichur (a Chennai suburb) who had to keep her 77-year-old father’s dead body in her home because the floods prevented freezer boxes from reaching her and even if she had managed to secure one, the whole idea was rendered useless with the lack of electricity. She kept the body wrapped in a bedsheet for 2 full days and nights as she waited for the water recede – she lit incense sticks from time to time to keep the foul odor at bay. “My father deserved better,” Deepika told TOI. Deservance is an aspiration that all humans have. You work hard, you are ethical, you are well-meaning and so you expect Life to be fair to you. You often always think you deserve more than what you are getting from Life. And then Life deals you a hand, catching you totally by surprise, reminding you in the process that Life happens not because of you, but in spite of you. If you are wise you will humbly accept the learning Life offers you through such an experience and move on. It is when you miss the learning, and choose to instead resist the Life that’s happening to you, that you suffer! Prassana’s and Deepika’s stories are just two among the several million that you can hear from Chennaiites just now. And all of them will point you in one – only one– direction…just take Life as it comes, accepting it for what it is. But there are many who simply don’t get this; they don’t understand Life. Even as the floods were marauding Chennai, a friend pinged me on Facebook messenger. He observed: “I hope there’s no financial loss for you.” He didn’t appear to be interested in knowing if my family and I were safe. My reply to him was: “I have nothing material with me to lose.” Which is indeed true! Our 8-year-old-and-enduring bankruptcy has left us literally without material possessions. The few “things” we have, we have learnt to be detached with them, about them. The lesson that Prassana learnt with the Chennai deluge, we learnt through our bankruptcy. And that is the most beautiful quality about Life as a teacher – she always gives you the test first and the lesson later! And what she teaches you, when you internalize the lessons, make centered, anchored and grounded. Chennai is moving on. And everyone here will have to move on too. Because there is no other way. When Life takes over, you just go with the flow. In this case, the flow – literally, the water flow – is encouraging everyone to let go of all their material possessions and make a new beginning. The message is simply this: don’t grieve over what’s past and what’s lost! Don’t crave for deservance! Just get up, rebuild, renew and revive yourself! 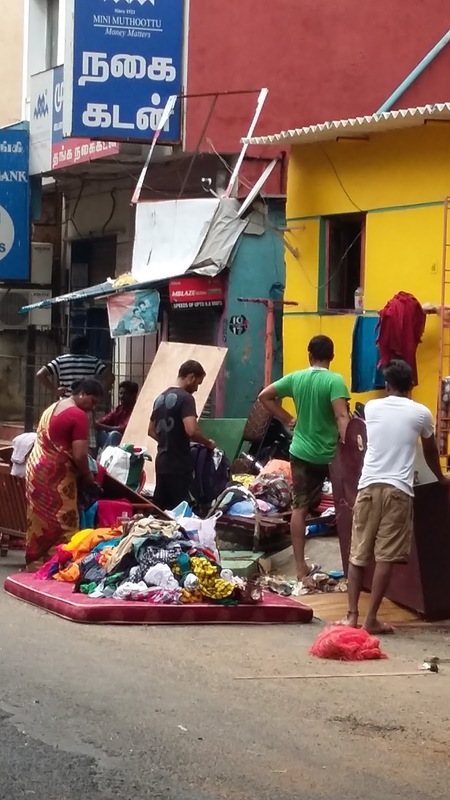 Chennai continued to amaze – and humble – me with her attitude on the third consecutive day in the aftermath of the worst rains and floods that it has ever seen in a century! Here are some moments of sheer bewilderment that I experienced as we went around several parts of the city today. · The staff at my bank’s branch were mourning the loss of their colleague – he was swept away in the floods on the night of December 2nd. Yet they attended to their customers patiently, diligently. Raji, the customer service officer, informed us that they were working full days this weekend – Saturday (5th December) and Sunday (6th December). I expressed surprise and called the move to work on Sunday historic – in the annals of Indian banking history! She replied, “The calamity is no less historic Sir. We would like to help everyone get on with their lives.” To be sure, this remark was coming from a public-sector bank officer! A part of the busy and important TTK Road was cordoned off by residents from K B Dasan Road as they tried to drain the water in their area. 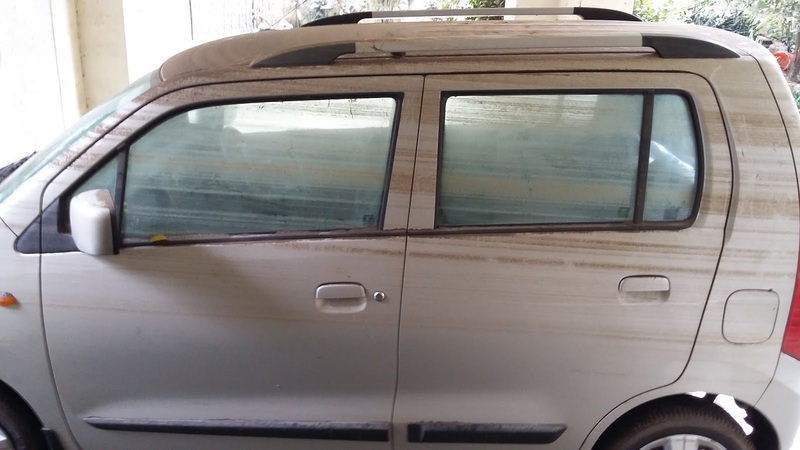 They had been water-logged for 5 days – without power and drinking water. Boats were still plying on K B Dasan Road. But even as some of the residents deployed a professional team to pump and drain water into the sewage system, across TTK Road, on C V Raman Road, several others among them regulated the traffic on behalf of the cops. Again nobody honked or complained. There was order, patience and empathy. We heard of a friend’s boss’ story from Kotturpuram. He had barely 15 minutes on the morning of December 3rd to collect all important documents, gather his family and leave his home. The water that came gushing in soon after left nothing – repeat nothing – usable; clothes, furniture, home appliances, computers, everything was destroyed! Yet he and his family have chosen to simply move on; they are not grieving what they have lost – which is, practically everything material they owned!!! There were rumors flying thick and thin across social media – predicting a horrendous end to Chennai later next week! A young friend, who was rushing off on relief work, had this to say, “Can we do anything to prevent the future from happening the way it must and will happen? Since we can’t, why not just focus on the present than worry about what is still unborn – the future?” Such a spiritual perspective – born right in the throes of an apocalyptical crisis! Everywhere we went, people were immersed in relief work. Students, doctors, managers, artists, filmmakers, actors, business leaders, traders, autorickshaw drivers, government employees – everyone is chipping in with whatever they can. 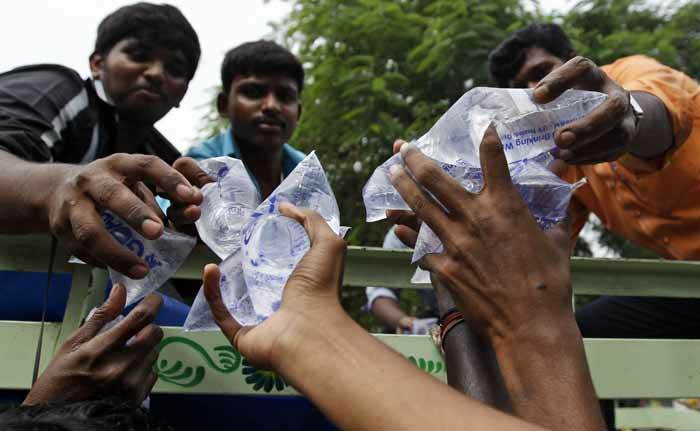 Chennai suddenly is a city that is driven with purpose, empathy and compassion. 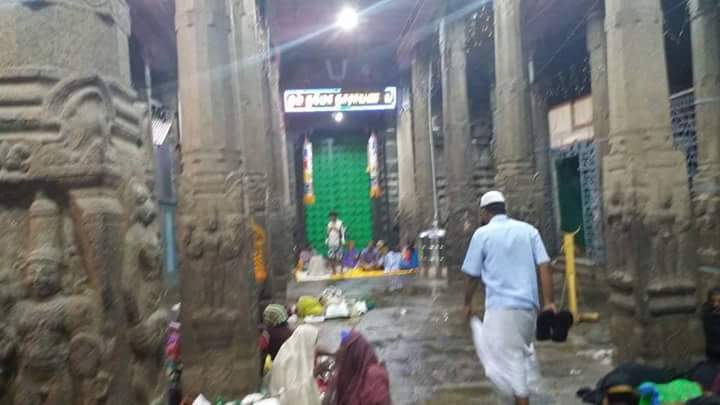 My most enduring image of the day came via Facebook – it showed a Muslim man walking through a Vaishnavite shrine in some part of Chennai; he was there to lend support to a relief camp inside the temple. It’s an image that will stay with me for a long, long time. My daughter, who’s all of 20, had been saving for months to be at the Bacardi NH 7 Weekender Music Festival in Bangalore this weekend. She had bought her tickets from her student earnings. But she canceled the trip and joined a bunch of people supporting relief work. She told us: “I just can’t take my mind off what’s going on out there. I don’t think I can enjoy the festival when my city and my people are struggling to get drinking water and food.” I teared up hearing of her decision – both as a parent, and as a fellow Chennaiite. Our entire day today, yet again, sums up why being in Chennai, even in such a time, is so beautiful. We are seeing a city that clearly is living up to what Sahir Ludhianvi wrote for Mohammed Rafi to sing, and make immortal, in Hum Dono (Dev Anand, Nanda, Sadhana, directed by Amarjeet/Vijay Anand, music by Jaidev) in 1961. Chennai, like Sahir Ludhianvi’s poem, has infinite depth. It has soul. And so it knows how to preserve and persevere. This is what I have learnt from Chennai over the past few days. As citizens who are ‘earning a living’ we are perhaps cold, business-like and, well, even clever. But as a people who are coping with an enormous crisis, who are picking up the threads of our material Life, we are every bit human! And that’s why we will never quite cease to amaze ourselves! Any calamity brings with it a deep spiritual learning. From Chennai right now, the learning is simple: Get Up, Let Go, Move On! Chennai has leaped– not limped please, I repeat, leaped – back to normal. This morning Vaani and I went around the city in an auto-rickshaw. Even as water levels all over had receded dramatically, the spirit of the citizens of Chennai soared! We saw some very rare, interesting scenes. Motorists and traffic cops engaging in cheerful banter. A volunteer inspiring motorists to cross a deep trench – cut through the road to speed up water drainage – on North Usman Road: he wore the biggest smile that I have seen in days. At gas stations people waited patiently. No honking. No public display of impatience. Hawkers and street vendors went about setting up their displays. Cheerfully, enthusiastically. Ashok Nagar, from what we saw, was the worst affected. The ground floor of most homes in 9th, 10th, 11th, and 12th Avenues had been invaded by the most innocuous, hard-to-imagine, intruder in Chennai – water. This is where water had risen to almost touch first floor levels – up to about 12 feet. 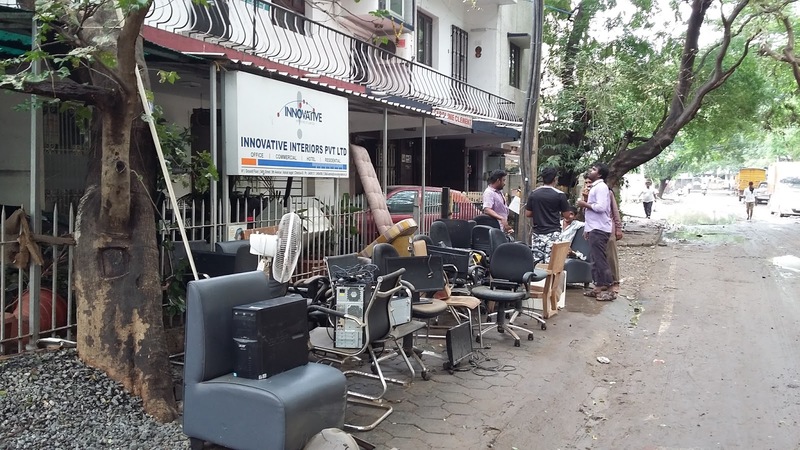 Furniture, TVs, computers, cars, home appliances – nothing’s been spared. This is one calamity that struck across social strata. From the lower income group folks to those who live in bungalows and own, in some cases, more than two cars! 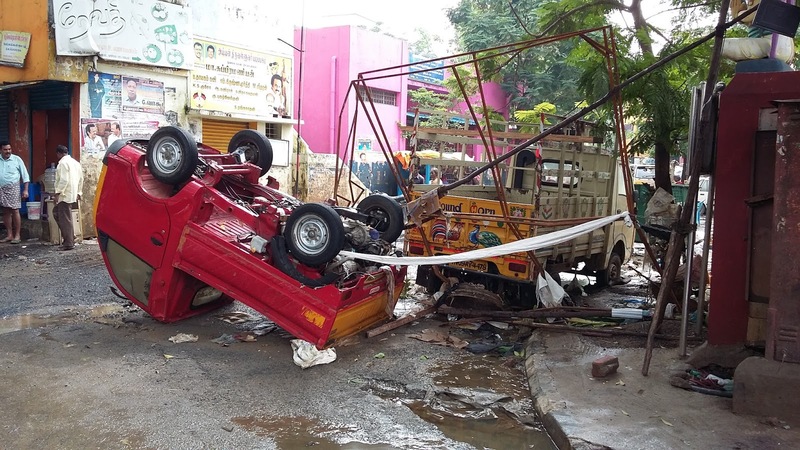 As we rode through 9thAvenue and beyond, we saw cars washed away from a long distance – appearing to be parked precipitously on pavements; in reality they were tossed over by the gushing water! Some of them had been reined in by kind folks to the gates of their own houses – an act of absolute courtesy to car owners who would then not have to go too far search for them. Others had turned turtle or were buttonholed into street corners – their windscreens smashed; such was the water’s force and fury! But nowhere did we see anyone moping and mourning. Almost Zen-like, people were picking up the threads of their material Life. There was something surreal about their equanimity. What we saw was a personification of the ‘this-too-shall-pass’ philosophy! Her spirit – of acceptance, let go and move on – was evident everywhere. People just went on with their lives. 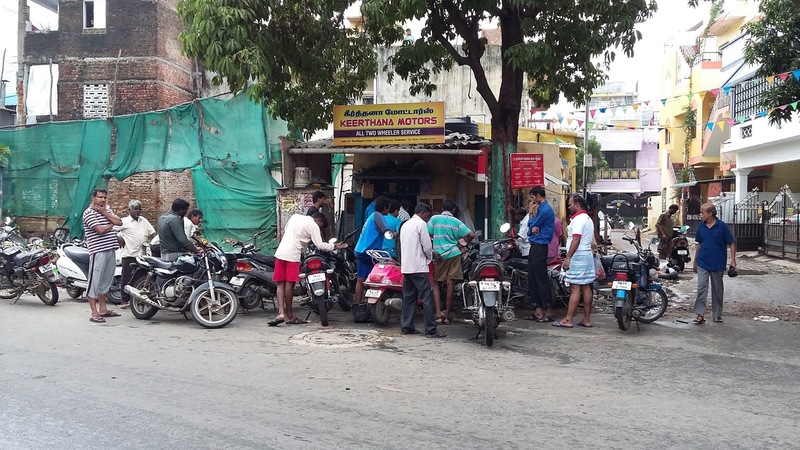 Mechanics were busy helping two-wheeler, auto and car owners to get their vehicles going. Saravana Bhavan, near Ashok Pillar, opened uncustomarily late. But they opened. And, sure enough, soon they had hundreds of hungry breakfast-seekers thronging there for sambar, idli, vadais and their signature filter kaapi. People were washing their cars, furniture and home appliances. Or they were putting out their soaking wet sofas and cushions to dry. There were those bailing out water in buckets on to the street. There were long queues outside all ATMs that had cash – and, importantly, power! But no one complained. 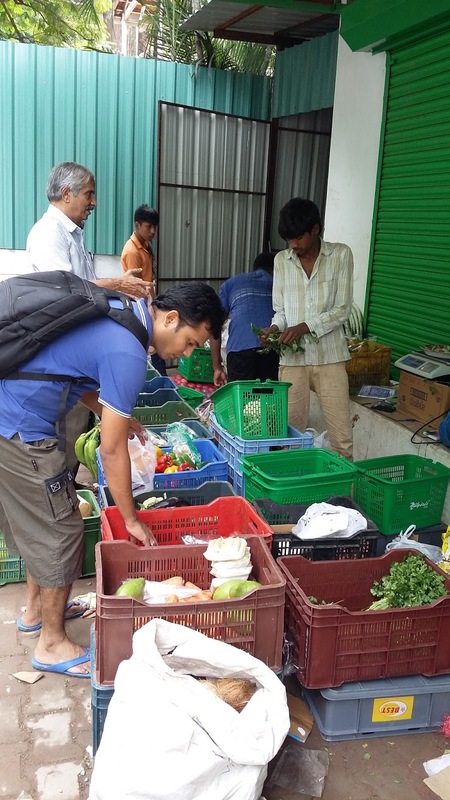 A vegetable vendor assured his patrons that he was selling all items at cost price for the day. Corporation workers made sense of the garbage and debris, even as they cleared up, that had been washed onto street corners and pavements. 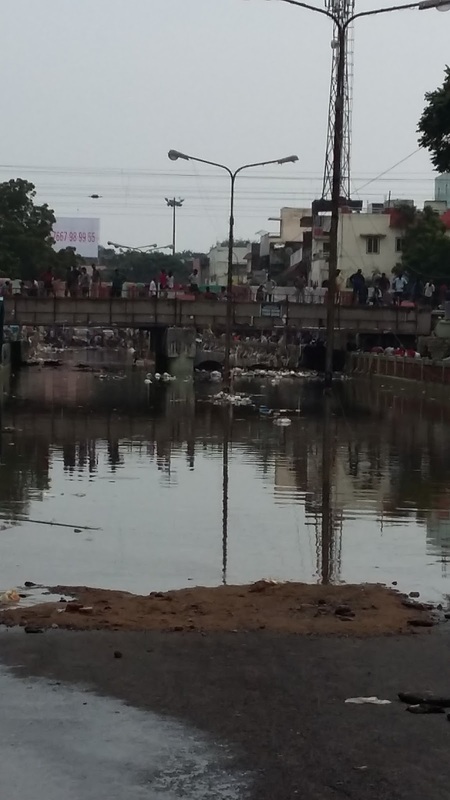 The Aranganathan subway – one of the critical links between Ashok Nagar and T.Nagar – was still flooded to the brim and had floating debris; just looking at it reminded me of the Cooum that perhaps once was! Of course, while a sign outside Big Bang Theory (a favorite, new-age, happening nightlife place) said “Bar Closed”, the ubiquitous TASMAC stores were open – and doing brisk business already! If you just saw the material devastation and estimated the amount of money that people have lost individually, you would have expected them to be glum and grieving. Our auto driver, Shankar, exclaimed, “Saar, minimum Rs.1 Lakh per family is required urgently to get their houses back to normal.” That was his sweeping, generalized estimate, albeit, a naïve one too! Yet we only saw people who displayed an uncommon – in ordinary times – trait: practicality. I was amazed and humbled, at the same time, that people have simply accepted what is and moved on. 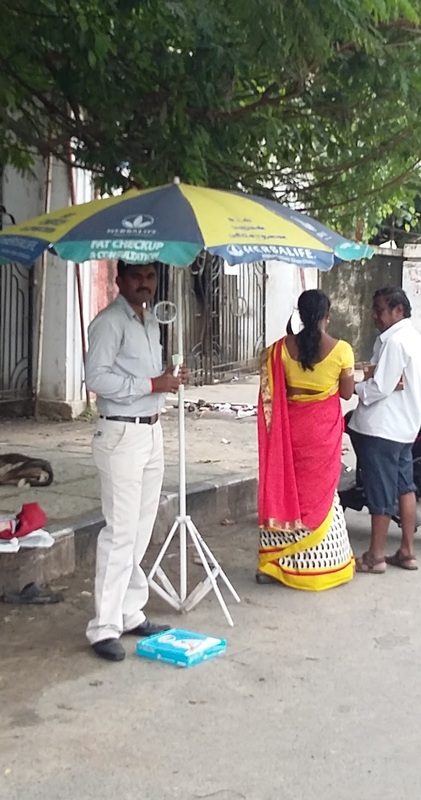 Outside a gas station on Kodambakkam High Road, a Herbalife volunteer stood with a weighing scale, under a branded kiosk-umbrella. He invited me to check my body mass index (BMI) and fat. He called out, “You can lose weight in just 10 days, saar!” I found his sales pitch opportunistic and jarring – a blemish on an otherwise pristine canvas, where loss and pain had been rendered irrelevant by acceptance, letting go and moving on. But then, isn’t moving on also about letting everyone live? His Life, and livelihood, I reckoned, thrived on the number of conversions he makes per day. So, upon reflection, I concluded that his valiant effort – even when fuel, water, milk and a warm, dry home matter more than BMI – is evident of a city moving on. To that Zen spirit, to her people, to Chennai, I bow.